Cowley College president Dr. Dennis Rittle recently had an opportunity to speak at a joint Lions Club meeting held Monday, September 29 at the Sirloin Stockade in Arkansas City. The meeting was attended by The Arkansas City Lions Club, Arkansas City Early Bird Lions Club, Arkansas City Lioness Club, and the Winfield Lions Club. Dr. Rittle shared information about his raising and ties to the area. In addition, he shared at length about the College and its direction for the future to include the many benefits of choosing Cowley College for a quality comprehensive education at a very affordable cost. Following his presentation, Dr. Rittle held a question and answer session with those in attendance. 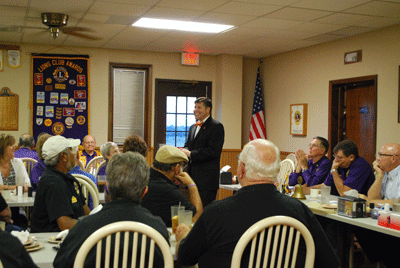 District Governor Dwayne Willis and Zone Chairman Frank Mull also spoke at the joint Lions Club meeting.